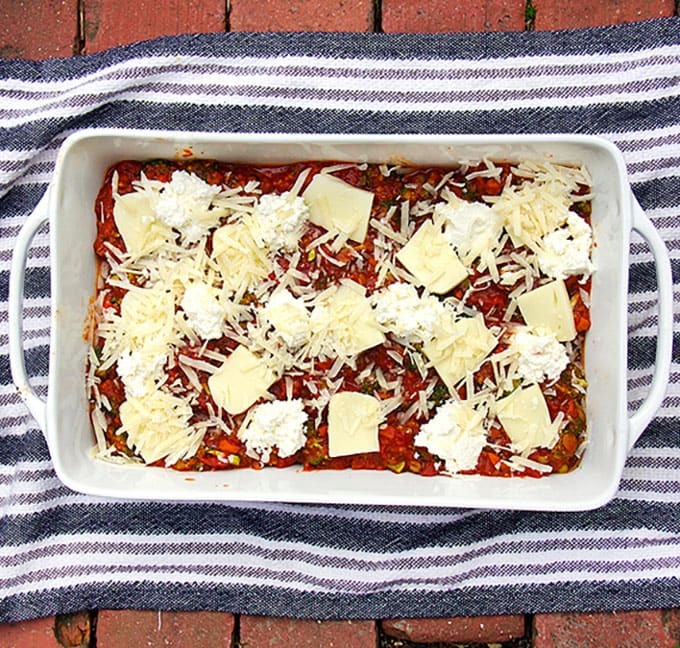 If you love lasagna, here’s a healthy, delicious, gluten free, no noodle eggplant lasagna with amazing sauce and three cheeses. You won’t miss the noodles! I’ll let you in on a little secret that only my family knows – I develop an addictive personality when there’s lasagna in the house. I joke that I can’t be left alone with lasagna – but it’s really no joke – I can’t focus on anything for more than five minutes before I’m headed to the fridge to slice off “just a little taste”. That goes on all day until the lasagna is gone and I’m crashing from an overdose of carbs, meat and cheese! So sadly, I rarely make lasagna. But a few days ago a lightbulb popped on in my head about a way that I could make my favorite dish a lot more light and healthy. So instead of panning the globe, I spent the week experimenting in the kitchen. (My family and neighbors ate lots of lasagna this week!) The happy result is No Noodle Eggplant Lasagna. 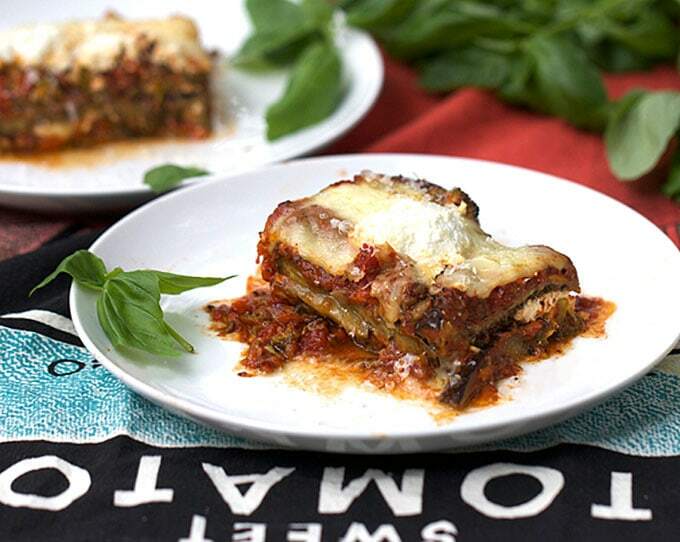 Firstly, roasted eggplant slices take the place of noodles as the structural element of this lasagna. As I embarked upon this “no noodle” lasagna project, I was worried that if the noodles were truly a critical element of lasagna, I’d be in trouble. I asked myself – what is it about lasagna that makes it so irresistible? I decided that the noodles are far down on the list in terms of flavor. 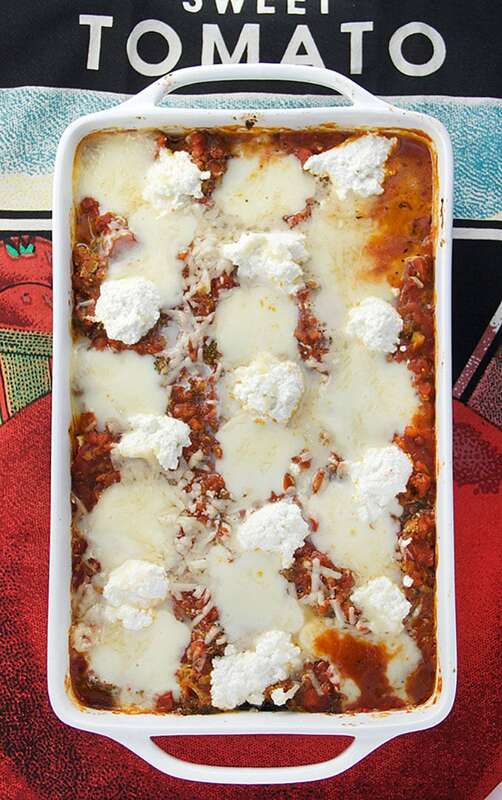 They do provide a good texture and a great structure – making it easy to cut the final lasagna into perfect squares. But if you don’t mind your “squares” being a bit “rustic” – there’s really no need for noodles. 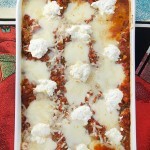 In my opinion, a lot of the excitement over lasagna comes from the cheeses, and most of the flavor is in the sauce! I love a rich, thick, meaty sauce. This one is very meaty, only there’s no meat. I added “meaty-ness” by caramelizing chopped carrots and mushrooms to bring out their umami flavors. Then I added lots of chopped broccoli for meaty texture and healthy fiber. 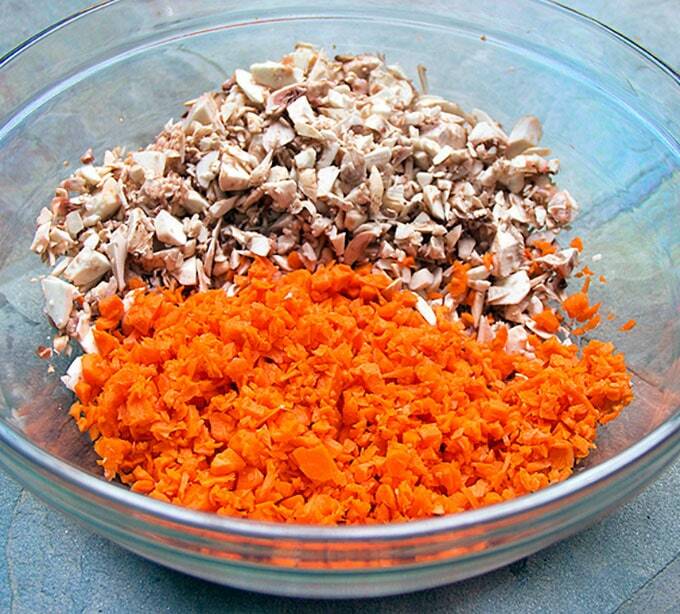 A food processor makes the chopping quick and easy. The carrots and mushrooms cook for about 15 minutes in some olive oil, which brings out their meaty, umami flavors. The fuzzy tops of broccoli have a great texture. 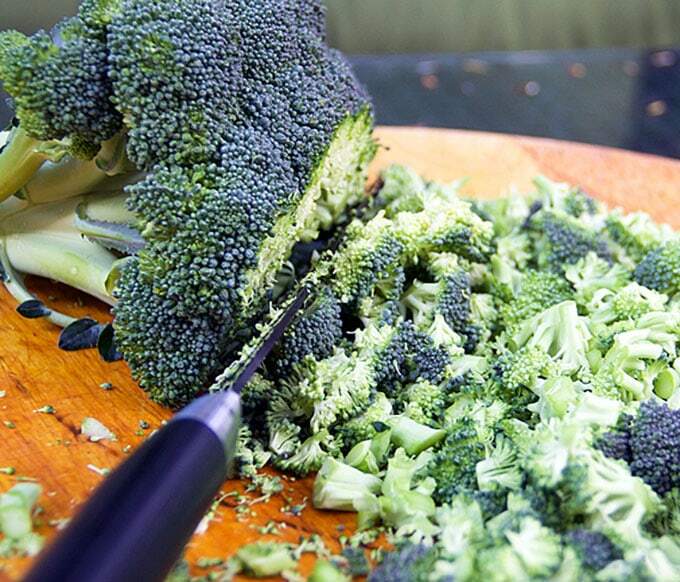 If you turn a broccoli crown on its side and shave off 1/2-inch slices, you’ll get a perfect sized chop. The broccoli goes into the sauce raw and gets cooked in the oven when you bake the lasagna, so it retains a lot of freshness and crunch! 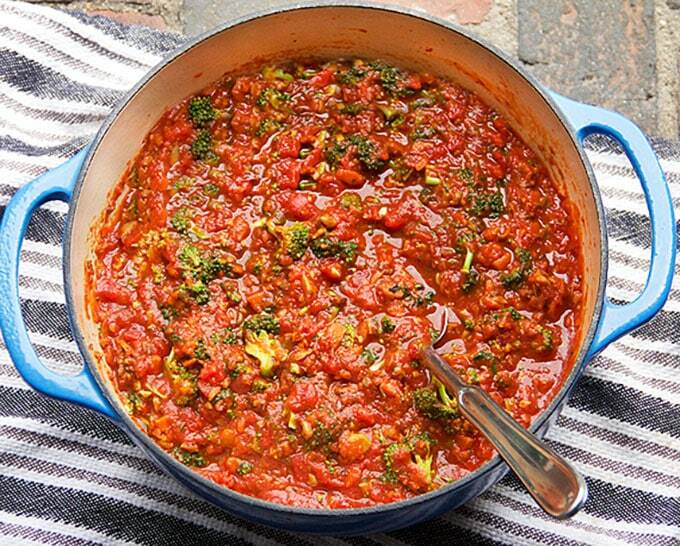 Adding the broccoli and the caramelized carrot-mushroom mixture makes for a delicious, thick and “meaty” vegetarian tomato sauce. I made this 4 ways, before finding the perfect recipe for a veggie-intense sauce with tons of great flavor that’s also thick enough to hold the eggplant lasagna together. Eggplant – to salt or not to salt? I had to get to the bottom of this debate before I could feel comfortable making a recommendation. I did the research and my conclusion is “don’t salt and sweat eggplant.” It’s a waste of time and effort. Here’s a great article I found by food blogger Ann Mah. She came to the same conclusion after she conducted a survey and did her own experiments. I did an experiment, too – I nibbled on the leftover scraps of roasted Italian eggplant and they were sweet and delicious! I also cut up and roasted a large globe eggplant to see if it’s more bitter than the little ones, as some of my research suggested. It was also sweet and delicious with no salting and sweating! 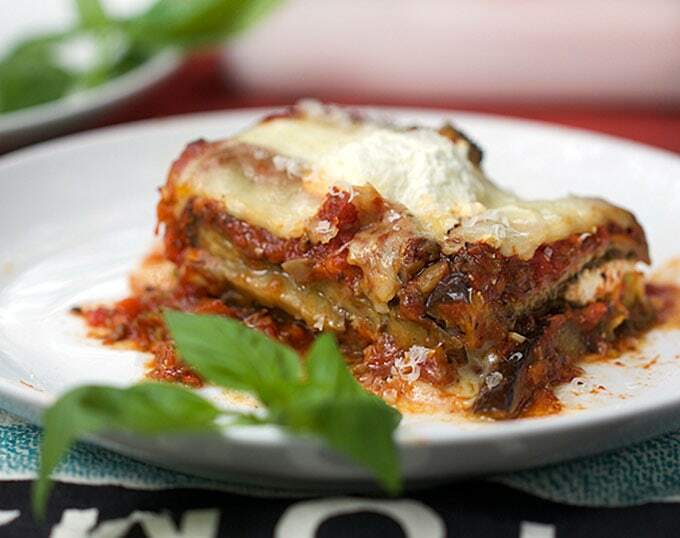 This eggplant lasagna is layered the same way you would approach a traditional lasagna, only you have to be a little creative about how you arrange the eggplant “noodles” so they fit well in the casserole. One of my challenges was to find the best roasting time for the eggplant slices and the right sauce consistency so that the lasagna would hold together when I cut it. By the fourth try, it worked. Voila! And you might also enjoy these two delicious, tomatoey, cheesy, eggplant dishes: No-Fry Eggplant Parmesan and Eggplant Parmesan Stacks. Here’s the recipe for No Noodle Eggplant Lasagna. And here’s to going back for seconds, thirds and even fourths! If you try this eggplant lasagna recipe I hope you’ll come back to leave a star rating and a comment. I’d love to know what you think. 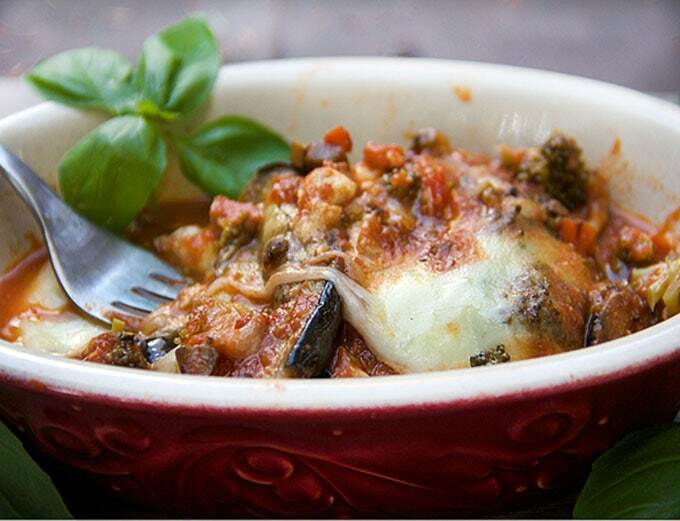 Layered, lasagna-style casserole of roasted eggplant slices, vegetarian primavera sauce, and three cheeses. 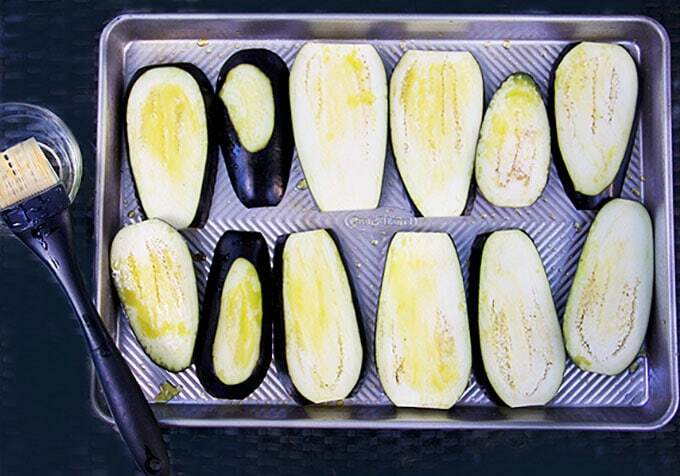 4 or 5 Italian eggplants (2 1/2 pounds) cut lengthwise into 1/2 –inch slices – you should have 5 good slices per eggplant plus a few smaller end pieces. 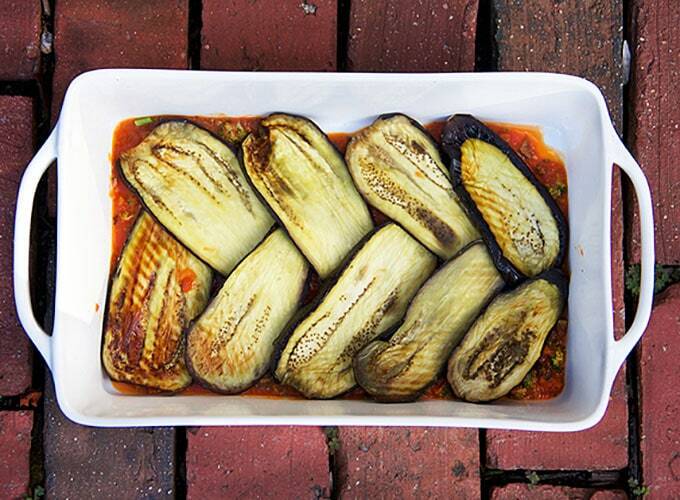 Make the Eggplant Noodles: Preheat the oven to 400ºF. Position oven racks in the top and bottom positions. Lightly oil two jellyroll pans. 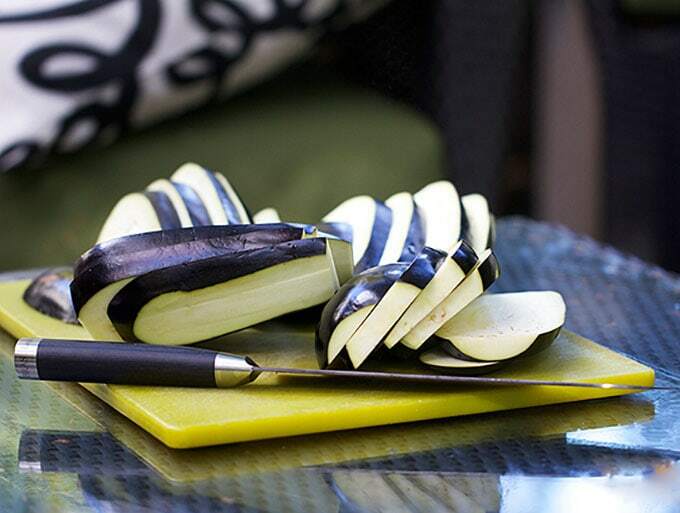 Divide eggplant slices between the two pans, laying them out in a single layer. Brush the tops with olive oil (about 3 tablespoons total) Sprinkle with 1/4 teaspoon of salt per tray, and season with some fresh ground pepper, to taste. Bake in the top and bottom shelves of the oven for 30 minutes, switching the position of the trays half way through. Remove from the oven and set aside to cool. 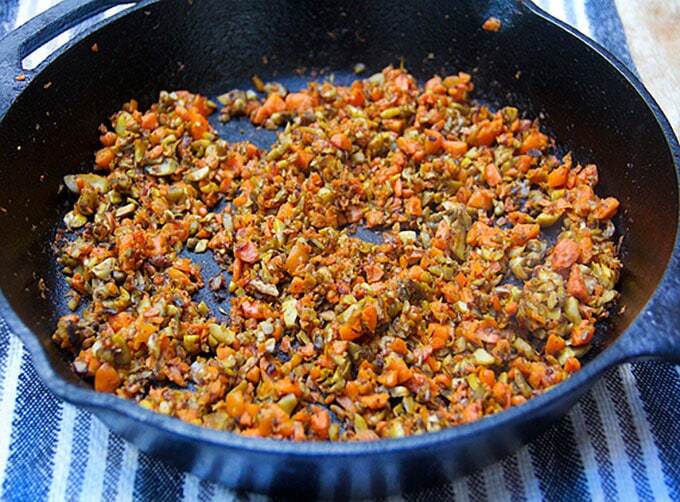 Caramelize the Carrots and Mushrooms While the eggplant is roasting, heat two tablespoons olive oil in a large skillet. Add the chopped carrots and mushrooms and cook, over medium heat, for 12-15 minutes, stirring frequently and pressing them down into the pan with the back of a spatula, until they’re lightly browned. Remove from the heat and set aside. Make the Sauce While the vegetables are caramelizing, make the sauce. Pour 1/4 cup olive oil into a large saucepan or dutch oven. Add the chopped garlic and red pepper flakes. Turn up the heat and when the garlic starts to sizzle a bit, lower the heat to a simmer and simmer, stirring, for 30-40 seconds (don’t let it brown) and then pour in the crushed tomatoes, tomato paste, water, and basil. Simmer sauce, partially covered, for 20 minutes. Remove from heat. Stir carrot-mushroom mixture and chopped broccoli into the sauce and set it aside. Assemble the Lasagna Preheat the oven to 375ºF. Lightly oil the bottom and sides of a medium-sized casserole dish. Spread 3/4 cup of sauce into the bottom of the casserole. Arrange half the roasted eggplant slices on top (the arrangement will depend on the size of your eggplant and your casserole dish – see the photo of how I did it) Add half the remaining sauce on top of the eggplant. Arrange half the mozzarella, ricotta and parmesan evenly over the sauce layer. Arrange the remaining eggplant slices on top. Add the rest of the sauce. Finish with the rest of the cheeses. Cover the casserole with a double layer of foil and bake in the middle of the oven for about 55 minutes, until the lasagna is heated through and the cheese is melted. If you like your cheese browned, remove the foil for the last 15 minutes of cooking time. Remove the casserole from the oven and let it rest for 10-15 minutes. Slice into portions with a sharp knife, and serve with parmigiana cheese and fresh basil sprinkled on top. Big time family favorite. I made this again yesterday per request of my daughter when she came home from college one night. She wanted comfort food and was so happy to have this!! It freezes great too!! Hi Jen! I’m so glad you all enjoyed!! I’ve just made this dish for the probably 12th time. It’s such a great sauce and so good for the omnivore and vegetarians in the family. It freezes really well too! I have nothing against lasagna with pasta, but this looks pretty wonderful to me. Actually, it’s pretty close to the way I made eggplant parmesan, when I’m not in the mood to bread the slices of eggplant. Goodness what a inspirational recipe. Of course I am a major egg plant lover. I have never cut egg plant length wise. It never occurred to me. Look my Mother always cut it the other way, so that’s the way it’s done. Lol. I am liking the new idea. Delicious innovative recipe, my dear. This looks amazing and it’s very timely. I made the most disappointing vegetable lasagna last week and I needed a little inspiration and creativity in this department. I am excited to try it out! By the way, I loved your earlier Sunny Oaks stuffed cabbage piece and meant to write. It was amazing to read from others who had been there too. Very touching. This blog is fantastic! I have been meaning to make one using zucchini. But I am loving your choice of eggplant for layers. Looks fantastic. Thanks Marlene 🙂 Zucchini sounds great too! 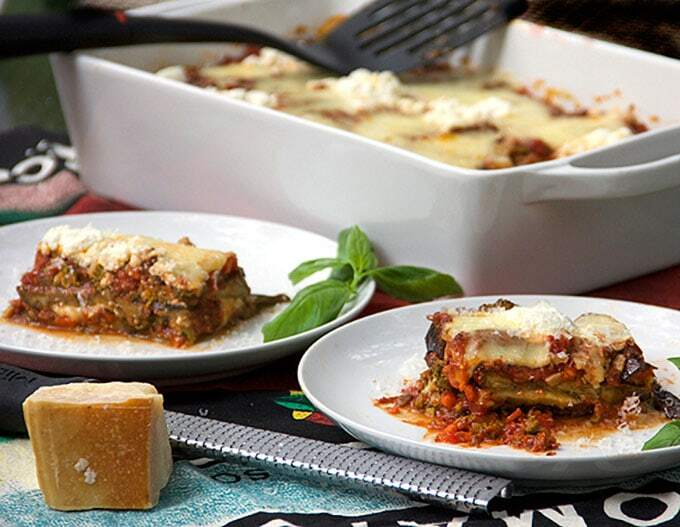 If eggplant Parmesan and lasagna had a baby…. This looks and sounds perfect! I would not miss the noodles one bit! Lisa, This looks great. I can’t wait to try it. I love lasagna and eggplant, so this is a match made in culinary heaven. Thanks for the recipe! PS: I’m also glad for some support for my long-held position that salting and draining eggplant, like seeding tomatoes, is a practice that should be abandoned!